Just five years ago, in the aftermath of a devastating earthquake in Pakistan, the United States Government committed a total of $510 million in relief and reconstruction efforts in that country. And the US Embassy in Islamabad was at the center of that operation under the leadership of then Ambassador Ryan Crocker. 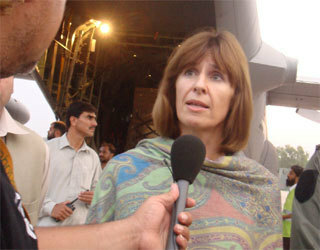 The US Mission in Pakistan has never been too far away from the spotlight, of course. This is a country with growing terrorist incidents in all its largest cities (Islamabad, Karachi, Lahore, and Peshawar), not to mention repeated attacks on the US posts in Karachi and Peshawar in the last several years. Also, in the lead up to the Kerry-Lugar vote and in the firestorm that followed the signing of the Enhanced Partnership with Pakistan Act of 2009 which provides $7.5 billion assistance to Pakistan, opinions and conspiracy theories buzz the interwebs. I understand that only funds for the first year has been appropriated so far, but that has not dim the controversy over the expanded assistance, staffing and accountability that comes with the bill. That’s probably not the end of it. And that’s why US Mission Pakistan has 22 authorized public diplomacy officers. Consular officials at the U.S. Embassy in Islamabad are providing assistance and support to American citizens – and especially Pakistani-Americans – concerned about the welfare and whereabouts of relatives who may be among those displaced. U.S. Embassy Consular officials are coordinating with Pakistani government agencies as well as international and non-governmental organizations to obtain, update, and disseminate up-to-date information about the situation to all concerned American citizens who contact them. Lt. Gen. John R. Allen(right), the acting commander of CENTCOM, and U.S. 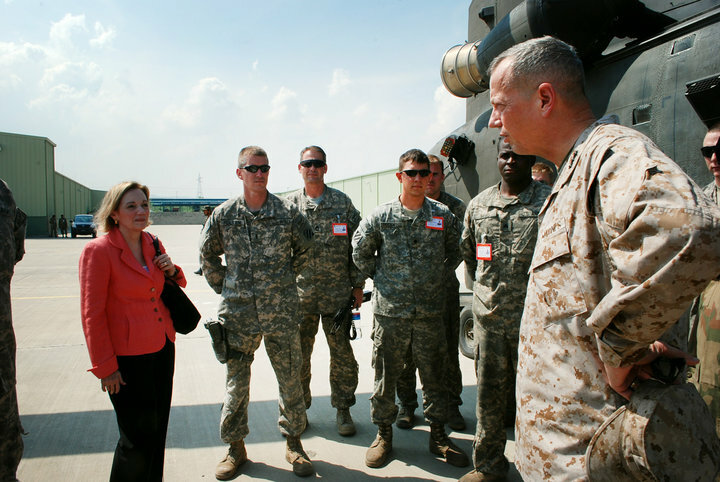 Ambassador to Pakistan, Anne W. Patterson, talk with soldiers of the 3rd Combat Aviation Brigade, Task Force Falcon’s Pakistan relief unit, TF Raptor, Aug. 5, at Ghazi, Pakistan. 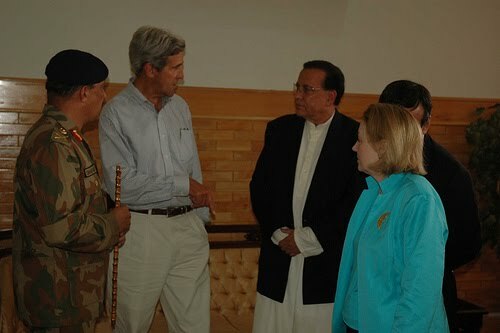 Governor of the Punjab Salmaan Taseer receives Senator John Kerry and President Zardari at Multan Airport and briefs them on the flood situation in South Punjab. Pakistan’s Ambassador to the US Hussein Haqqani and the US Ambassador to Pakistan Anne W. Patterson are also present. They then fly over the flood-affected areas and stop at an army relief camp in Jampur. The U.S. Consulate General in Karachi represents the USG in Sindh and Balochistan provinces in Pakistan. In Sindh province, 190,413 houses were damaged and 2,269,846 have been affected by the disaster. In Balochistan province, 19,619 houses were damaged and 312,774 have been affected by the floods (UN/OCHA numbers). We should perhaps point out that ConGen Karachi’s s point person for public affairs is no other than Dr. Elizabeth Colton. Is it simply an accident that the CG in Karachi seems to be “showing the flag” and is “seen” more than the US ambassador? I’ve searched for more ambo photos but really, Islamabad seems stingy when it comes to these types of photos, both in its website and its Facebook page. August 6: William J. Martin, Consul General of U.S. Consulate Karachi, Pakistan, speaks to U.S. 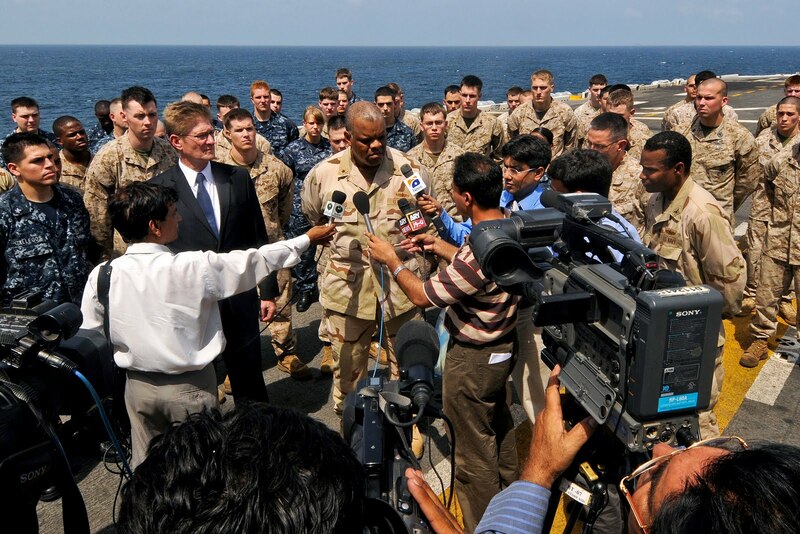 Sailors and Marines during a Pakistani media visit aboard USS Peleliu (LHA 5) Aug 6, 2010, in the U.S. 5th Fleet area of responsibility. Peleliu sent its first wave of supplies ashore Aug. 12, 2010, to establish a support element and communications hub for Navy and Marine Corps heavy lift aircraft. August 18: U.S. Navy Rear Adm. Sinclair Harris, commander of the Expeditionary Strike Group Five, and William J. Martin, left, Consul General, U.S. Consulate General in Karachi, Pakistan, conduct interviews with members of the Pakistani media aboard amphibious assault ship USS Peleliu in the North Arabian Sea, Aug. 18, 2010. 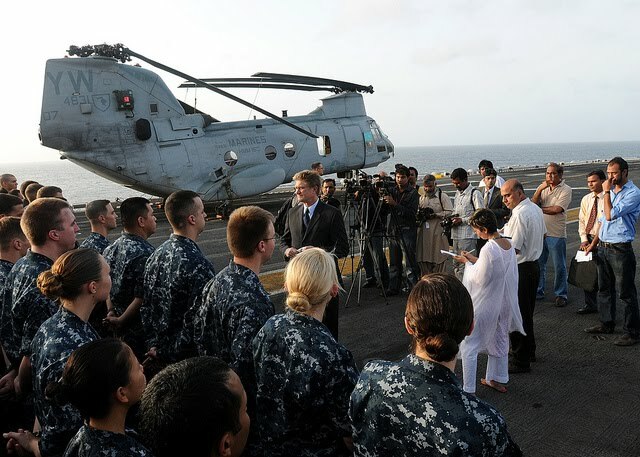 The media embarked Peleliu to cover the platform responsible for providing helicopters to aid the Pakistani government with helicopter heavy lift capabilities in flooded regions of Pakistan. 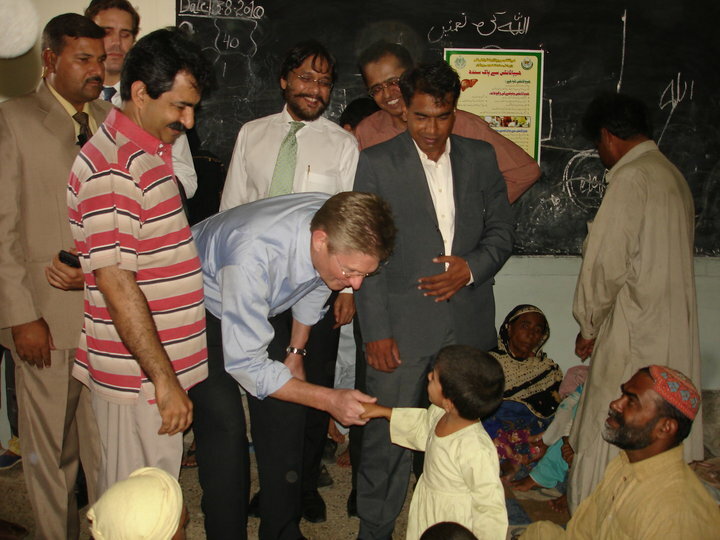 This week, Consul General William Martin visited the Keamari camp in Karachi for displaced victims of the flooding in Sindh province. After talking with some flood victims he gave a statement on the aid and relief efforts that continue to try and help flood victims throughout the country. 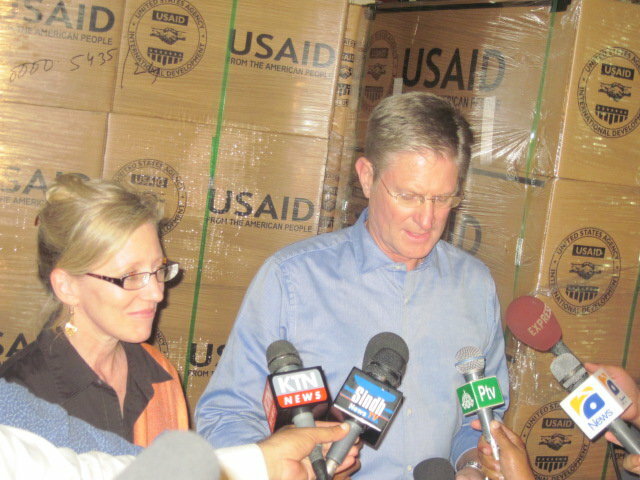 Consul General William Martin’s press briefing at the Karachi airport cargo terminal about the newly arrived 530 rolls of heavy-duty waterproof and fire resistant plastic sheeting for use as temporary shelters from USAID for the flood victims of Sindh Province. The sheeting material will provide dry shelter for 46,800 people in Sindh province. 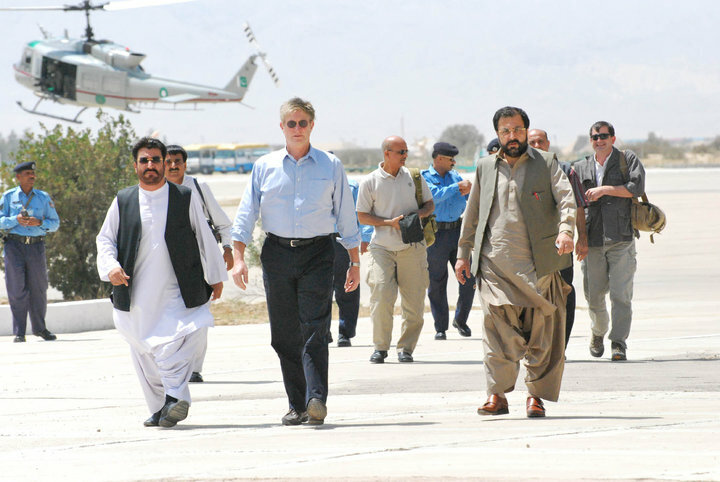 Consul General William Martin recently visited flood affected areas of Balochistan and did an aerial surveillance via helicopter and held a press briefing. CG Martin was accompanied by the Minister of Finance, Asir Kurd Galu, and Minister of Revenue, Zmarak Khan Achakzai, along with other Consular staff. U.S. Consulate General Lahore staff visited flood affected victims in Multan and did an overflight of flooded areas to conduct a needs assessment. The Consul General Carmela Conroy visited IDP relief camps and a school with staff from IRDO. The US Consulate General in Peshawar represents the USG in the North West Frontier Province (Khyber Pakhtunkhwa) where 175,935 houses were damaged and 4,365,909 people were affected by the floods. We are disappointed to see very limited information coming out of Peshawar. We can only find a couple of publicly available photos of our top civilian representative in the district. Its website is a little more than a placeholder, with all press releases coming out of Islamabad and no new media presence. We don’t know, however, if Ms. Rood and her staff have returned to Peshawar or are still temporarily posted at the embassy in Islamabad. Here is an OCHA map with overview on the affected areas by provinces as of August 18, 2010. You can provide help right now by making an online contribution to the State Department’s Pakistan Relief Fund. Text “Flood” to 27722 from your mobile phone to give $10, or by downloading this form and mailing it with your check. You can also help by contributing to non-government and charity groups conducting relief operations in Pakistan. Check out Charity Navigator’s list of charities providing relief in the country with their corresponding ratings. Be sure to read their tips to ensure that your donation reaches your intended good causes. Text the word “SWAT” to telephone number 50555 using your cell phone. The text will result in a donation of $10 to the U.N. High Commission for Refugees (UNHCR) Pakistan Flood Relief Effort. Every $10 helps provide tents and emergency aid to displaced families.